For a couple of years now I've been praising redspottedhanky.com, the train booking website. I've used it to book the majority of the trips on this blog for one simple reason - loyalty points. Every time I booked a trip I got points that could then be turned into money off vouchers for further railway journeys. Since I don't get paid to hie myself across the country, this was a nifty little bonus, and I happily said so. I mentioned them in blog post after blog post. I recommended them to friends. I even booked through them rather than other, cheaper sites so that I could get my points. That's what loyalty points do - they breed devotion. Over Christmas, I booked three more trips, quite expensive ones. One for the BF, who had to go to London for meeting, and two station collecting trips in January for me. 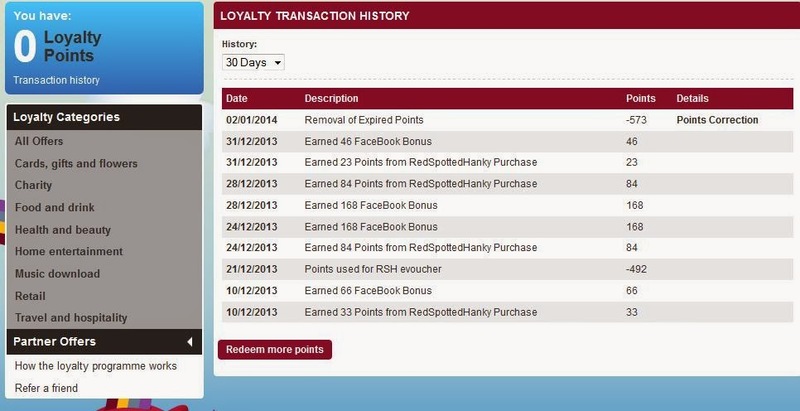 The points were duly added to my account in that last week of 2013. "Points correction"? The 573 points I'd earned in the previous week - nearly six quid of train travel to me - had all been erased. Apparently, you have to use all your points by the end of the year, or they're erased. Even points awarded on the 31st of December. It doesn't matter how many you have, how frequently you use the site, how soon you convert your points into loyalty purchases. Come the 1st of January, anything on your account is wiped out. Management have been consulted on this matter and a decision has been made that all points will not be reinstated as we do not have the facilities to accomodate this request. All points expiration dates and full details are within the terms and conditions once agreed to when entering our loyalty scheme. We apologise for all inconvenience caused. Firstly, why bother consulting with management if you do not have the facilities? If you can't do it, you can't do it. If you can consult with managers about whether to do it or not, that kind of implies you could if you wanted to. Secondly, thanks. Thanks for nothing. I mentioned this on Twitter and got a bunch of replies from people who'd had the same problem - points just vanishing in 2014. No-one was very happy about it. We understand that you don't want points hanging around for years, unspent, redspottedhanky. Or people building up hundreds of pounds worth of points and then getting free first class travel on the Caledonian Sleeper or something. We're not naive. If you look at that statement above, you'll see that I had just converted my points to a rail voucher: I was on top of things. Incidentally, that rail voucher doesn't expire until the 31st of December 2020, so you're clearly fine with an expiration date in the distant future for some things. If the points expired after, say, a year, that would be fine. You buy a ticket on the 1st March 2013; you've got until the 1st March 2014 to do something with it. That's fair enough. Or perhaps something similar to the slightly successful Tesco Clubcard scheme - if the account is unused for two years, the points are cancelled off. But an arbitrary cut-off date does no-one any favours - especially one right in the middle of the holiday period, where people have other things on their mind. I know a fair few regular rail travelers who are deeply irritated that their little bonus has been lost. Their little payback for being loyal has been thrown away. It's left a nasty taste in my mouth. I don't feel like a valued customer - the exact opposite of what a loyalty scheme should do. I'm embarrassed that I recommended them to friends and readers. I have a £4.92 e-voucher on my redspottedhanky account that I will have to spend. You don't have to bother giving me the points; I shan't be returning to your website to spend them.